New Power Ups - shooting the last alien of a wave will now award you with a bonus or power-up. Those at your disposal are the double-shot and the triple-shot. Tweaked graphics - some minor changes to the player's shots and the explosions have been replaced with a better looking effect. Joypad support - you can now play the game with a joypad, rather than the keyboard if you prefer. 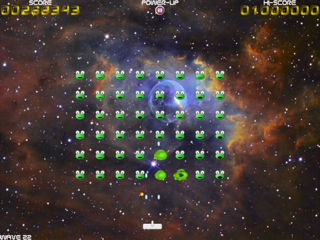 The aliens are now more fierce and occasionally fire accurately, which they do more regularly as the game progresses. You will need to keep your wits about you on the later waves.